Moving to the left, you see the dresser between the crib and bed. It was originally white when I thrifted it, then we stripped the paint and refinished it. I love the painted drawer pulls and the richness the dark wood brings to the room. On either side of the dresser are some vintage suitcases for toy/anything a toddler deems necessary to hoard storage. And, I guess if the room was decorated around anything it would be this rug. 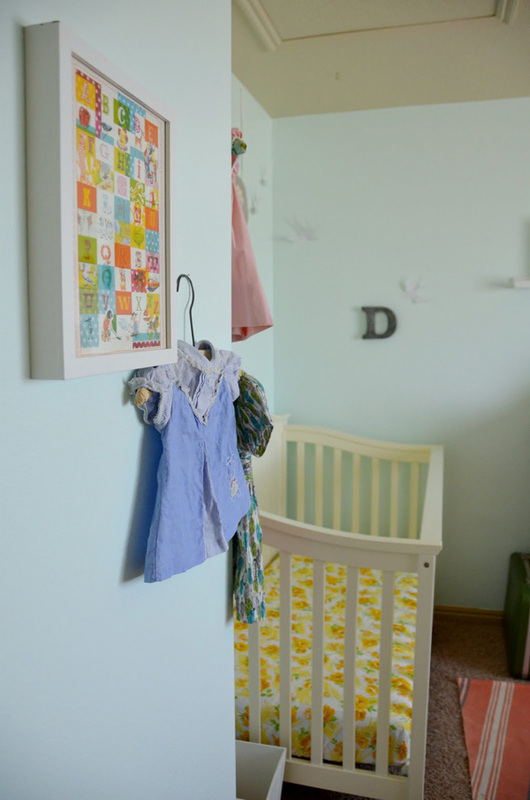 I loved the print and colors and it was one of the first purchases I made with the nursery redo in mind. 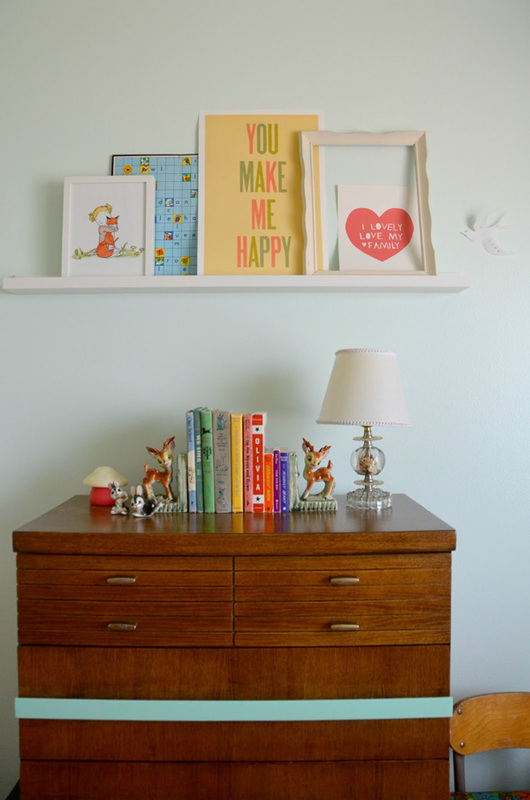 Above the dresser are some art prints, a frame, and a vintage Scrabble game board. I plan to switch this up a bit since a larger version of this print is on its way. I can't wait to get it - top knot! cats! party hats! On top of the dresser is a vintage lamp I used when I was little (probably all of my sisters used it at some point); it has little millinery flowers inside the glass. 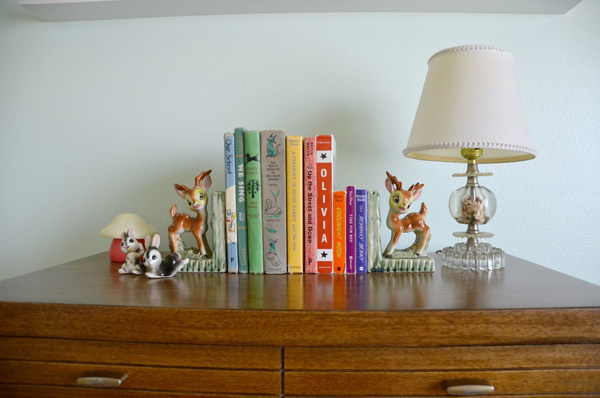 LM's favorite bedtime books as well as some vintage children's books are surrounded by forest animal friends, and the mushroom is a nightlight. Then we get to Lark's corner of the room (see topmost pic for an expanded view). 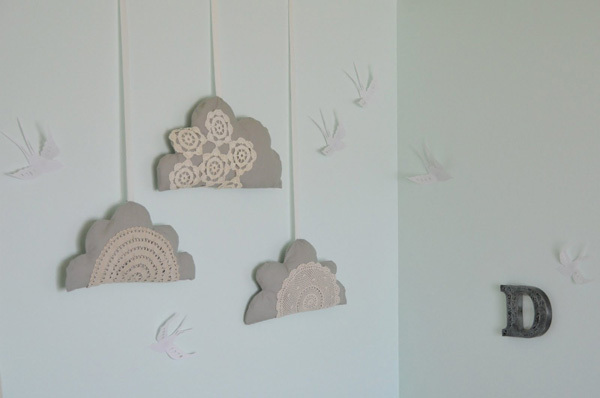 The clouds above her crib, as well as her crib sheet were handmade by me. 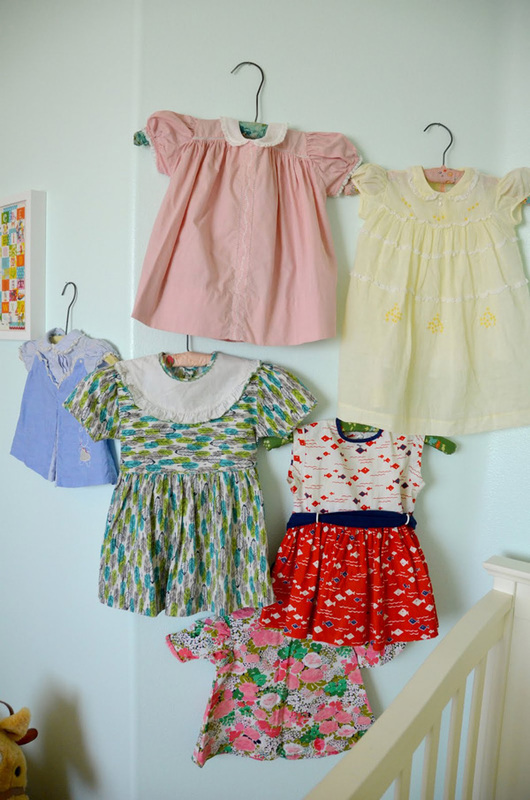 Her blessing dress (the light yellow one) was hanging to the side by itself, but then I decided to display some of my favorite vintage dresses along with it. It will be fun to change them up every now and then, especially since some of these see use! The rocking horse was a gift from my in-laws. And then we are standing back in the doorway! Finally, the corner directly across from the doorway (this view is if you were standing in front of the crib), is my quiet nursing spot. 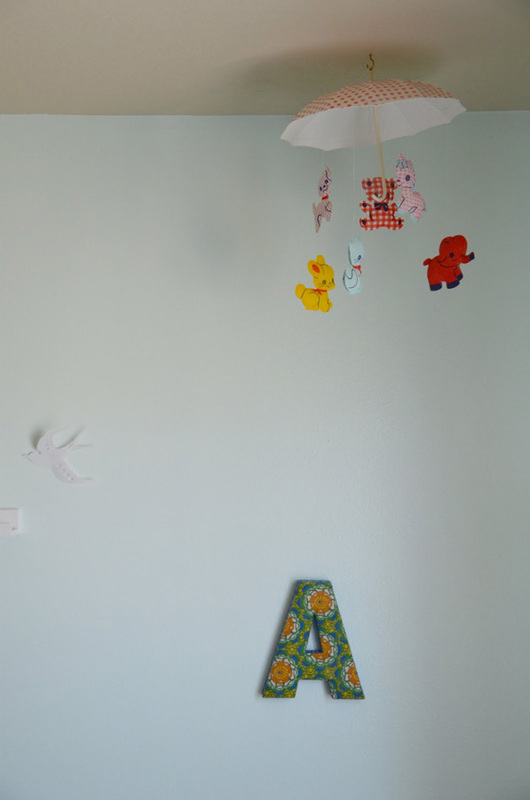 Above the rocking chair is a Noah's ark crewel that my mom made for my older sister's nursery back in the 70's, and you also get a peek at the closet doors with the bunting I made for LM's first birthday party draped above them. I hope you liked the tour! And, I can't remember what the paint color is called! I know I saved the swatch somewhere, maybe someday I'll come across it and update this post. UPDATE: I found where I tucked away the paint swatch. The wall color is Behr Window Pane and the drawer pulls are Behr Reef Green. Oh my goodness- it is so sweet! The dresser and the clouds are so pretty. I love all the colors and the little touches that make it so cozy. You did such a great job with everything. I love their room! Love, love that dresser. Everything looks great - you did an amazing job. Inspires me to get going on the redecorating I have on my to-do list. Lovely, everything is perfect! Great job! 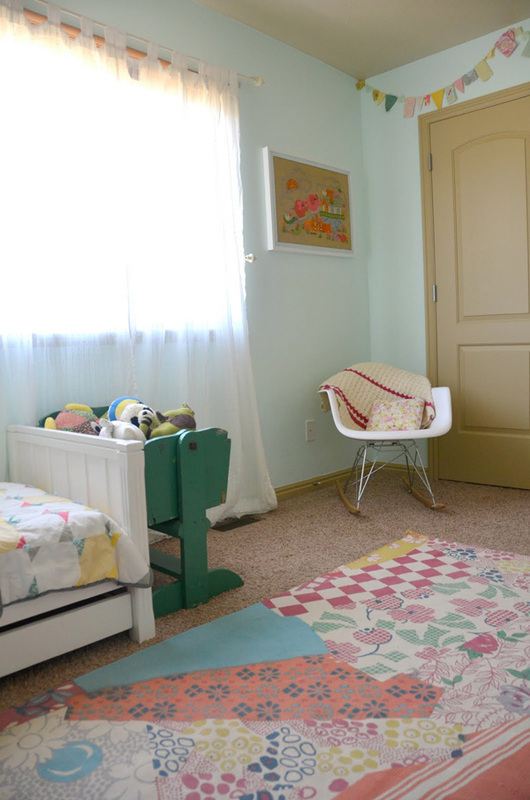 What a beautiful and special space for two little girls! I'm in love! Beautiful room, thanks for sharing. We have the sweetwilliam alphabet print in Poppet's room too, I LOVE it!! So so lovely and cozy! Beautiful! I love everything about this room. 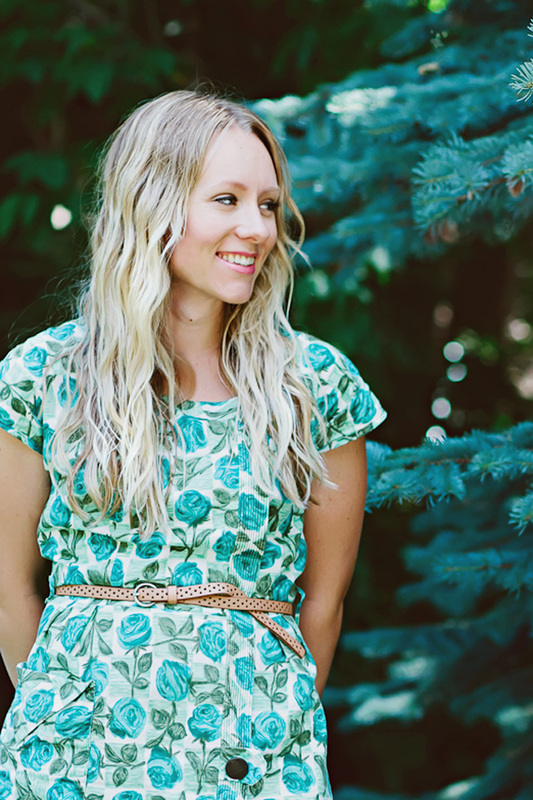 It is so bright and fresh and so many sweet details. 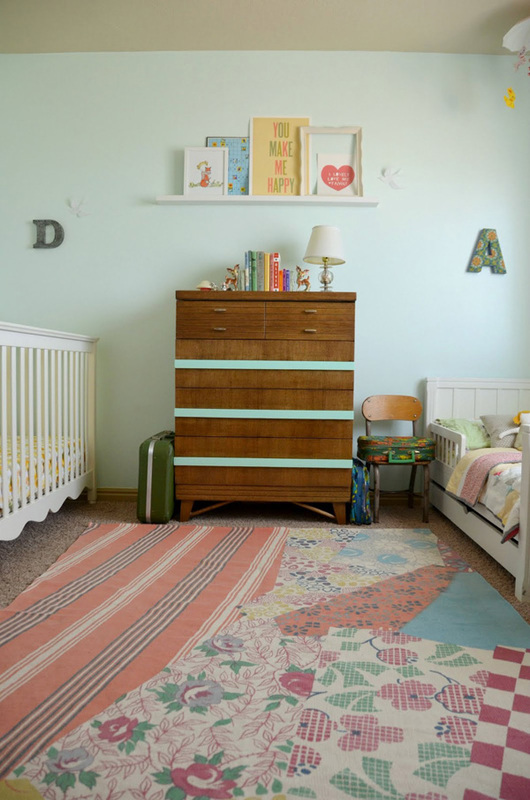 the dresser is amazing and that rug - Oh my! What a wonderful space for your girls. Looks fabulous! Every little thing is perfect! I love it when a project gets done, it's one of the best feelings in the world! Really wonderful! I love the subtle colors- I sometimes have a problem being subtle with my decorating. I love the rug as well! So unique, and I love how it divides the room (the patchwork on one side, and the stripes on the other). 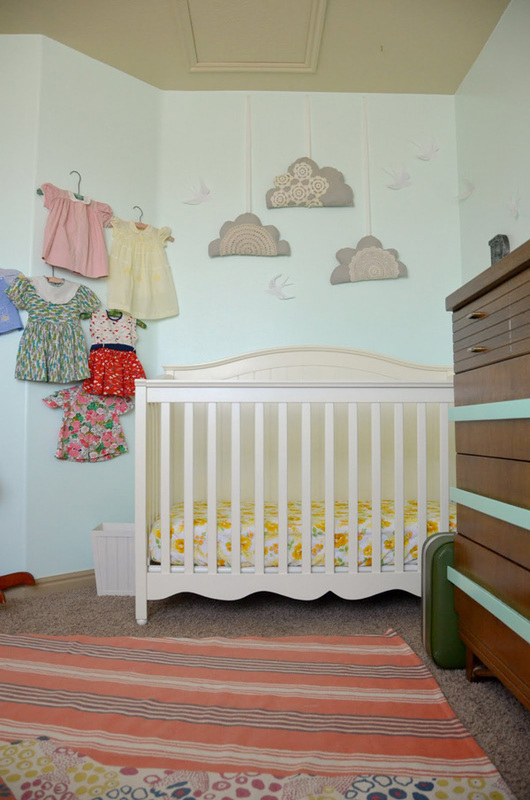 We'll be looking at a nursery redo for Avery soon, once she switches to a toddler bed from her crib- your room makes me inspired to do it soon! Very cute!!! The picture of the umbrella mobile brought back a rush of memories for me. Pretty sure I must've had that as a baby because I remember playing with the animals. I saw this room at ohdeedoh. I LOVE it! One of the first things I noticed was the floor...is that a quilted rug? Do you have a tutorial for it? I also love the rug and would love a tutorial! Also, can I ask where you got the crib?? 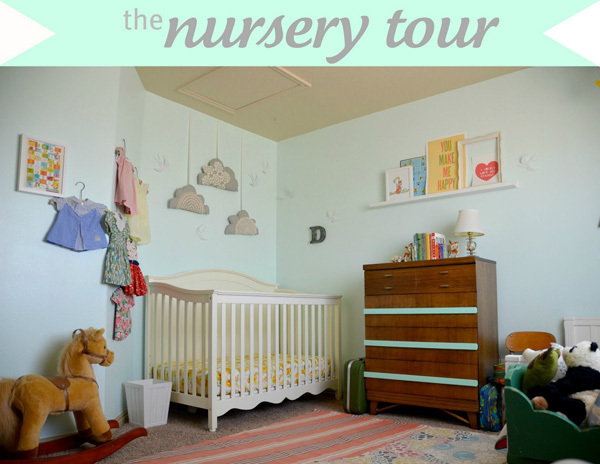 Such a beautiful nursery. So cute! 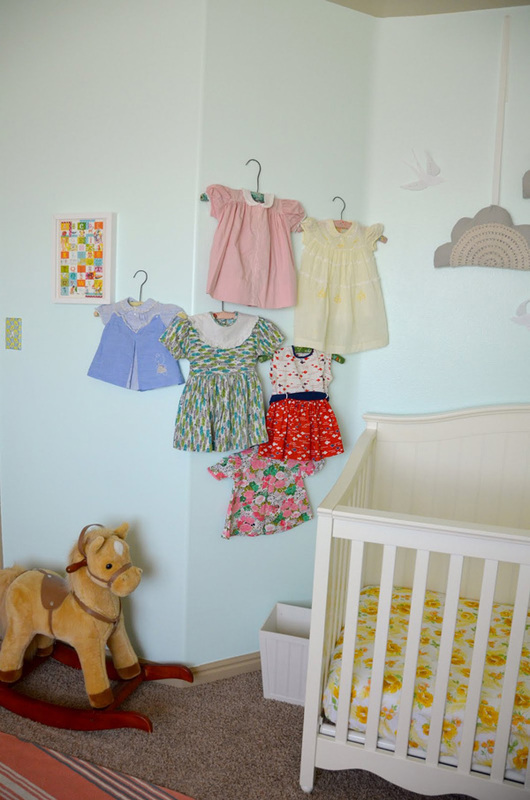 I'm having a little boy in a month and am having a tough time coming up with cute nursery ideas... I do love the vintage touches in this room! 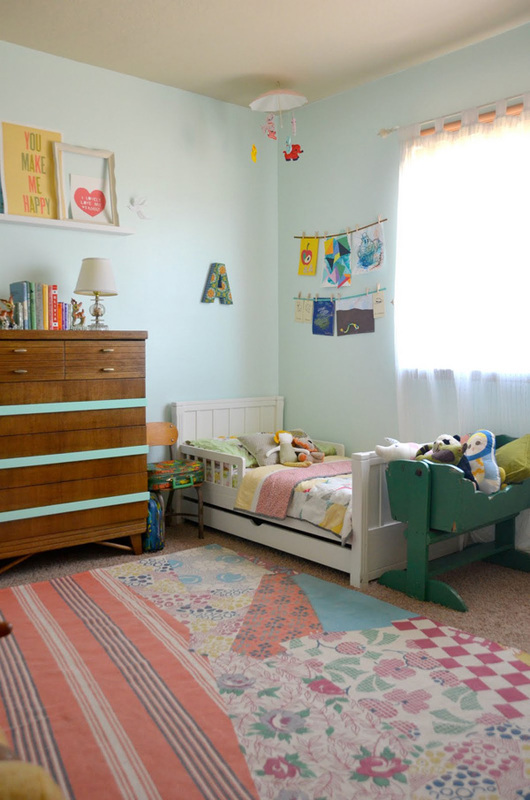 Thanks so much for updating with the wall color - it is EXACTLY what I was looking for after my first attempt in my girls' room looks like a mint ice cream explosion. ;) I am hopeful Window Pane will look as good in my girls' room as it does in yours. I love this. So eclectic, yet totally works. 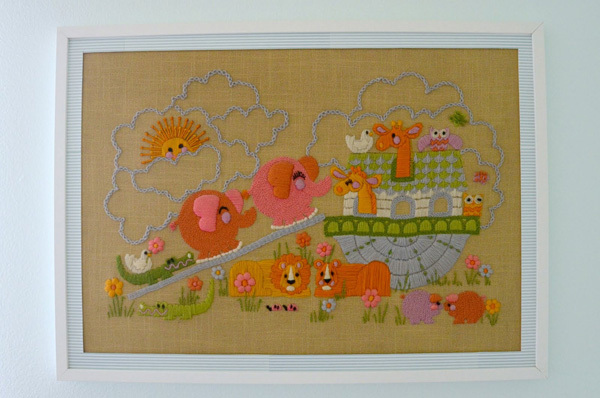 I had the same Noah's Ark crewel thing! I also had a "Now I lay me down to sleep" one. I think my aunt made them. 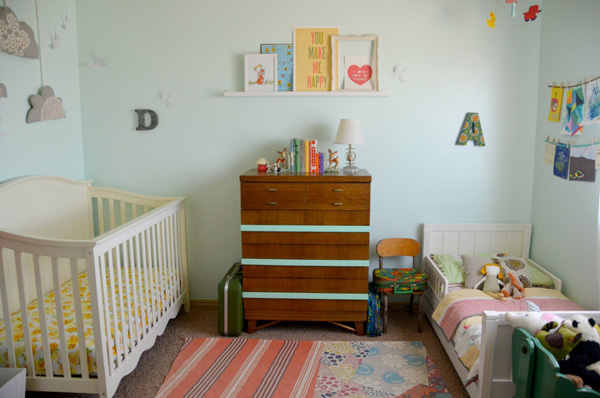 It's funny, I also painted my daughter's room aqua with a yellow ceiling!